Do you teach the doubles math strategy? Here is a fun activity for use with Google Classroom™ or Google Drive™ . 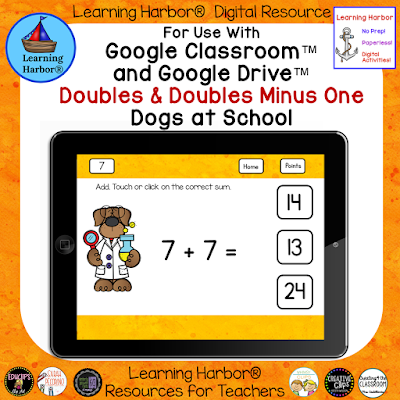 With this activity students practice doubles and the near doubles of doubles minus one. For example, 4 + 4 is a double and 4 + 3 is a double minus 1 or 1 less than the double. Kids will love the cute dogs at school theme. With this easy to use Google Slides™ activity they will be improving their mental math skills and their computer dexterity at the same time. Visit Learning Harbor® Resources for Teachers for more great resources and check out the FREE Growing Learning Harbor® Library.